Chinese Medicine is very interesting. I could be wrong in my understanding of it, but I believe their emphasis is more on PREVENTING disease than on treating or curing disease. I mean, if you don’t get it or have it you don’t have to treat it or cure it. I took a workshop this past weekend called The Yin and Yang of Nutrition: Customizing Your Diet for Optimal Health. You may recall, if you read any of the posts, that I took Yin Yoga Teacher Training earlier this year. During that training the teacher would mention things that had us all wanting more, so some of the information in the nutrition workshop could be related to the information in the Yin Yoga Teacher Training. There was a lot of information and I can’t write as fast as she can talk and flip slides. I managed to get one chunk of information that is the basis of it. But then from that there is a lot more information, of course. I managed to get that there is a food color and a food flavor related to the organ combinations. The flavor in excess can over stimulate the organs. There is also a direction in which the energy flows. In our Yin Yoga Teacher Training when they would bring up the Five elements and their relation to the organ combinations they would also mention the emotions one might be strongly feeling when their was an imbalance and the tease would come when they mentioned food. In this workshop we received more information. It was explained that Chinese Medicine is not about calories or macronutrients (carbohydrates (sugar), lipids (fats), and proteins) but about balancing the Qi. And, of course, balance comes via moderation. So the idea isn’t necessarily to NOT eat certain foods, but to eat necessary food to balance your Qi. I am not going to share all that we were told because one of the things this training continued to remind us is that nutrition is VERY individualized. Dr. Oz was even brought up because people often say that he contradicts himself all the time in that on one show he will say, “EAT THIS TO BE HEALTHY” and then on a show the following weeks say, “YOU SHOULDN’T EAT THAT”. And, in my opinion he is just highlight the trends and explaining how things are good for you. But good for you is not good for everyone. So having a show that is for everyone makes it look like he changes his mind when in actuality he is just talking to the masses. There is a lot of nuance in eating because we all have different needs. And our needs change. There is a tool that is used to help to know what to eat, but I am not going to get into that now. So keep in mind that everything is a guide and individuals have to dance their own dance. You can see, from my little handwritten chart, that in general the food color that is associated with Wood is green. Fire is red, Earth is yellow and orange, Metal is white, and Water is black. 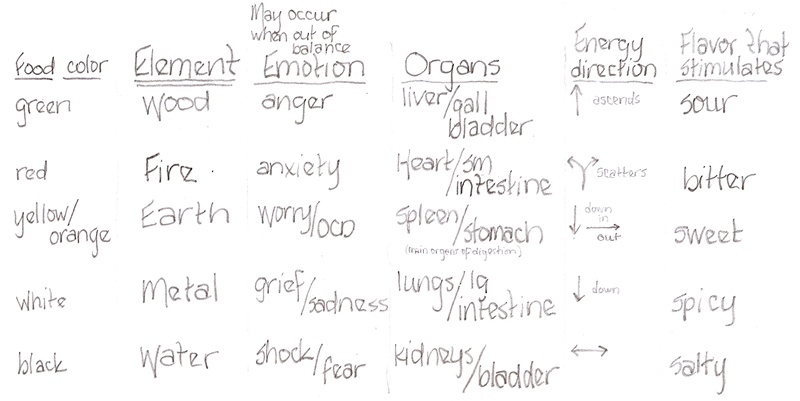 If your liver or gall bladder Qi is out of balance you may experience excessive anger. With your heart or small intestine Qi you may be experiencing anxiety, spleen or stomach may have you worried or obsessively thinking, lungs or large intestine may have you feeling sad, and kidneys or bladder could cause shock and fear. The flavor stimulates the organs and Qi so too much is not good as it can damage the organs. Again, it is all about moderation. If you eat to balance your energy (Qi) then you would be eating all the flavors and all the colors. So that idea of eating foods of all different colors is kind of in line with this. Keeping in mind that the “food” referred to is not prepackaged, over processed “food stuff”, but meat, vegetables, fruits, grains, nuts, and seeds type of food. Do you eat all of these colors? Do you eat all of these flavors?